We cache your most recent 40 events in the browser to speed up page load time, so for example the Active Visitor template is cached since it’s always the 1st notification to display in a new session. For the majority of sites, adding the Fomo code snippet to the <head> of your site will allow Fomo to display notifications throughout your site, and usually after updating site code, the browser reflects the updated code immediately. With popular Wordpress caching plugins, or custom implementations that use server side rendering, updates in the browser can take more than 15 minutes unless the cache in use is purged manually. Clearing the cache will speed up the delay between updating your site code and the browser picking up the Fomo code snippet. Normally whenever you update a template, this triggers code on our end to reset the cache w/ fresh notification data. If the data is also saved/cached on the client's side, updates may not be reflected in the browser until the cache is manually cleared, or it will check for new data at some specified interval. If you update a template and don’t see the new text/images in the browser within a few seconds, manually clearing the cache speeds this up. If you're uncertain whether your site uses a caching plugin, clearing your browser is a good place to start. => only the 'Cached images and files' box needs to be checked, otherwise it will log you out of other sites that have your email/password saved in the browser. Many premium Wordpress themes come with caching plugins- this is because caching usually improves page load time, and can create a better user experience. However, it can also cause issues with 3rd party apps that are trying to retrieve or update data. The two most common ones we've seen are WP Super Cache and SG Optimizer (SG Cache). 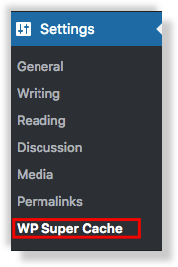 SG Cache usually displays a permanent button on your top navigation bar within Wordpress to purge/clear the cache. Most other caching plugins can be found under the Settings tab from the lefthand admin menu, and then you can follow their respective flows for clearing the cache.